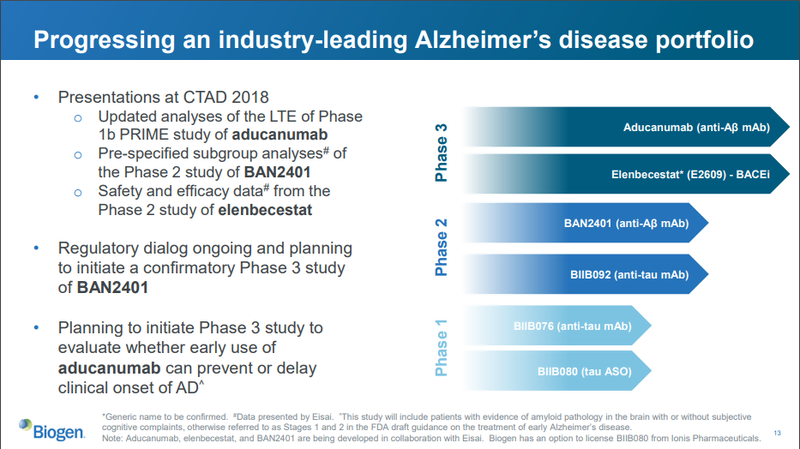 Biogen’s Alzheimer’s aducanumab failure heaps on more evidence that beta amyloid plaque is an effect of Alzheimer’s rather than the cause. Other companies pursuing the beta amyloid approach in Alzheimer’s are likely to fail as well, including Novartis and Amgen. Biogen is now a value stock and will likely stay dormant for the medium term, but could also be a value trap. Alzheimer’s disease continues to confound scientists as failure after failure is taking its toll on investors in the space. Biogen (BIIB) is the latest victim, having had its worst day in a decade late last month when it collapsed almost 30% because the company decided to discontinue its Alzheimer's treatment aducanumab in Phase 3. Aducanumab targets beta amyloid plaques in the brain, which clump together in the brain in Alzheimer’s patients. The question is, are these plaques the cause, or the effect? It seems from the many failures of this approach that they are the effect. Before we get to Biogen itself, there are other implications for other companies. According to Clinicaltrials.gov, there are currently 20 studies ongoing in Alzheimer’s Disease targeting beta amyloid. Novartis (NVS) and Amgen (AMGN) are involved in furthering CNP520, which aims to prevent the formation of beta amyloid plaques rather than dissolve them once they are already there. This will likely fail as well, if indeed the plaques are the effect and not the cause of Alzheimer’s. Data isn’t due until 2024. 200 attempts have failed already. For Biogen, the loss of Aducanumab has an estimated annual revenue impact between $10 to $12 Billion, and the price drop wiped out $18 billion in market cap, so in that sense the magnitude of the fall was justified. Biogen partnered with Eisai for this venture which dropped over 30% the same day so it looks like the markets valued the impact on revenue about the same for both companies. Biogen joins a group of other industry titans such as Pfizer (PFE), Johnson & Johnson (JNJ), AstraZeneca (AZN), Roche Holding (OTCQX:RHHBY), and Eli Lilly (LLY) who have all had similar setbacks dealing with Alzheimer’s/Dementia. Biogen does have a couple of more drugs in the pipeline that deal with Alzheimer's involving the tau protein, but those solutions are years away from materializing. With the ceasing of operations for aducanumab, the company also ended the testing of BAN2401. The hardest part of this failure is that the drug industry was hoping that the Biogen compound for their beta-amyloid drug would work and based on the lack of alternatives along with the amount of collective sunk cost/time the companies listed above have spent on this compound the industry is running out of options for Alzheimer’s. With the discontinuation of aducanumab, Biogen and Eisai will look at the $830 million spent over the past three years with nothing to show for it. On top of this, the company is still battling Mylan (MYL) over its multiple sclerosis (MS) product, which is the growth opportunity within their current revenue mix. The only positive from this development is that in the past companies were required to expense research cost, so these losses have already been taken and now Biogen can lower the expense line which should benefit operating margins in the upcoming quarters. Financially the company is still in a good position, so this decision diminishes its future growth rate. The company will continue to have strong revenue growth and earnings growth because of its MS work, but its pipeline and Alzheimer's division will bear this loss. Based on its last financial report, the company has about 6 products in Phase 3. Out of the six products though, a third of the products are in the Alzheimer’s Disease portfolio. Because of the current headwinds, this might be a company worth waiting out if you are a growth investor rather than a value investor. To try and stem the bleeding, after discontinuing its operations for aducanumab, the company announced a plan on March 25th to increase its buyback plan to $5B. This announcement indirectly sends a couple of signals to stock investors. The first one is that the company perceives its stock as being cheap and the recent pullback allows them to acquire shares at a value. The second signal is that the company does not feel that it has any projects in the pipeline that will have a better IRR than investors. The third signal is that if management is compensated on the stock price at the end of the year, this is a tactic to meet that target. The final signal is that increasing the buyback leaves less money for M&A transactions which might be needed to help bolster the pipeline after this failure. This might be the most detrimental signal, but the company just did an acquisition of Nightstar which diversifies its pipeline. For a buy/hold investor that can stomach a long period of minimal stock movement (i.e. a value investor), this could be a buying opportunity but the risk to the pipeline is viability as the company might be sitting dormant for a couple of years before popping again. For those looking for more of a momentum trade, this probably isn't the stock for you. Despite faltering, Biogen is still a financially viable company that will continue on with stability based on its current standings. The price drop is a one-time occurrence and it doesn’t seem that its price will drop much further if at all. Unfortunately, Biogen will probably struggle to grow versus its peers based on this setback and its diminished future growth rate impacts perceived value. Since the release of the Alzheimer’s development, the consensus of this stock has been negative with most analysts pushing their rating down to a neutral. While I have pointed out how this stock is probably at or around its low, it should also be clear that near-term catalysts for the firm are very minimal. If you’re looking for a stable stock with not much risk Biogen could be a capital preservation pick, but not much more than that at this point. The positives are that now that sentiment is so depressed, even a small positive surprise could push the stock higher quickly, but the chances of that are not great. Biogen now resembles a value stock, but it could also be a lurking value trap. The chief takeaway though is that other companies working on beta amyloid treatments for Alzheimer’s, like Novartis and Amgen, will probably encounter the same fate at the end of their own trials.